Another cute shot from a recent barn wedding on Long Island, NY. Just a short drive out from NYC this private estate provided the perfect back drop for a truly unique affair. The groom’s collection of antique tractors and farm trucks provided a wonderful array of props for some fun wedding pictures. Pictured here is one of the groom’s most prized possessions...the one and only white John Deere tractor that was ever made. 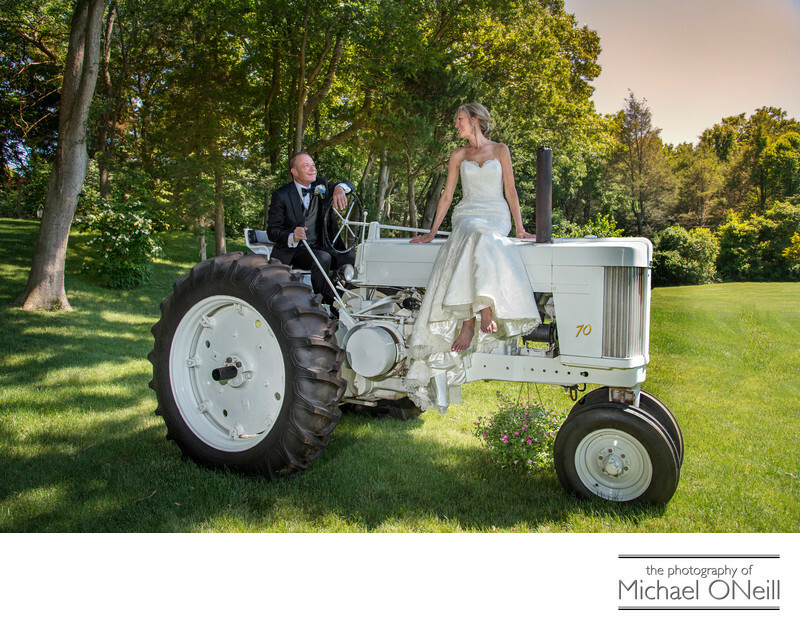 What could be more perfect for a barn wedding photo than this machine? The machine was professionally cleaned and detailed for the wedding day and the bride wasn’t the least bit reluctant to climb up on top for this cute, playful picture. Speaking of perfect, that is probably the word I would use to describe this entire event. The barn on the property was completely renovated for the wedding day with new walls, a decorative ceiling, a brand new dance floor and yes, even air conditioning. Elsewhere on this web site you will see additional photographs from this spectacular event. A barn wedding, whether held on a private estate like this one, or taking place at one of the Long Island east end vineyards or wineries, can be one of the most unique events ever attended by your guests. You can make it as casual or elegant as you wish and as comfortable as any of the most refined main stream wedding reception establishments. If you are planning a barn wedding on Long Island, or at any other location anywhere, give me a call. I would love the opportunity to bring my experience into play to create wonderful memories for you.